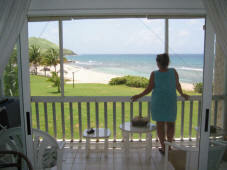 At Caribbean Breeze & Villa Dawn on St. Croix, USVI, there is an endless number of activities and attractions nearby. Whether you want to spend all day SCUBA diving, snorkeling and swimming or just relaxing by the pool enjoying the incredible view, you will find something to suit your every desire at these Virgin Island vacation rentals. Rent directly from us, the owners, and save! We handle our own management and marketing so we don't have to pay a management company for their services. You get more for your money at Caribbean Breeze and Villa Dawn! Christmas and New Years week's rates are higher. Contact us for rates and availability. Christmas and New Years weeks will book up to a year in advance. Don't wait too long to make your reservation! Click the button below to book your stay online using our VillaDawn.com secure server. To avoid losing your preferred dates...book online now! We can refer you to a chef, a masseuse, limousine service, taxi tours, provisions, babysitting and additional maid service. Just ask and we will do whatever we can to help you! A 10% USVI accommodations tax is additional, $500 refundable security deposit required. No smoking, of any kind, inside the villa. Check in 4pm, check out 11am. Rentals are generally Saturday - Saturday or Sunday - Sunday (Some exceptions may apply). There is a 10% surcharge for Easter and Spring break weeks. Additional maid service is available for an additional charge. We can arrange for your vehicle rental and for you to be met at the airport by the car rental agency, all at the best rates on the island! Click here to see our rental agreement. Click Here for Special Villa Discounts! For more information or to reserve Caribbean Breeze or Villa Dawn please give us a call. For additional information, to send an email and/or for availability click on the bottle! and may not be used for any other purpose without express written permission by the owners of this website. If you see any errors, bad links or any information that is out of date or incorrect please contact our webmaster. Thank you!